161126 TSCC State Champs — Tasmanian Equine Endurance Riders Association Inc.
Tasmanian State Championship Committee, Inc. The 40km ride has been added for those who were planning to enter the 40km at the cancelled Nietta ride. The 95km ride will be held as 3 legs - 45, 35 & 15km. This will be an elevator ride, meaning you can retire at the end of the 2nd leg after 80km, or continue on to finish the 95km. PRE-RIDE VETTING Friday afternoon from approx. 14:00 onwards. Also 40km riders can vet Saturday morning. VET-GATE-INTO-HOLD for the 160km & 95km rides. This means that your ride time doesn’t stop until you present to the vet. Don’t panic if you are unsure as the walkthrough Friday evening will clear it all up. The 40km will be normal TPR if busy. BEST CONDITIONED run outs will be held at approx 08:00 Sunday morning – the top 5 in each ride in each division will be asked to present (possibility of under saddle as well). PRESENTATIONS will happen at approx. 09:30 Sunday. If you can volunteer at any stage over the weekend – it would be greatly appreciated – let’s make it a fantastic event! A canteen will be run by the Fire Brigade Fundraising Committee all weekend – so please support them! 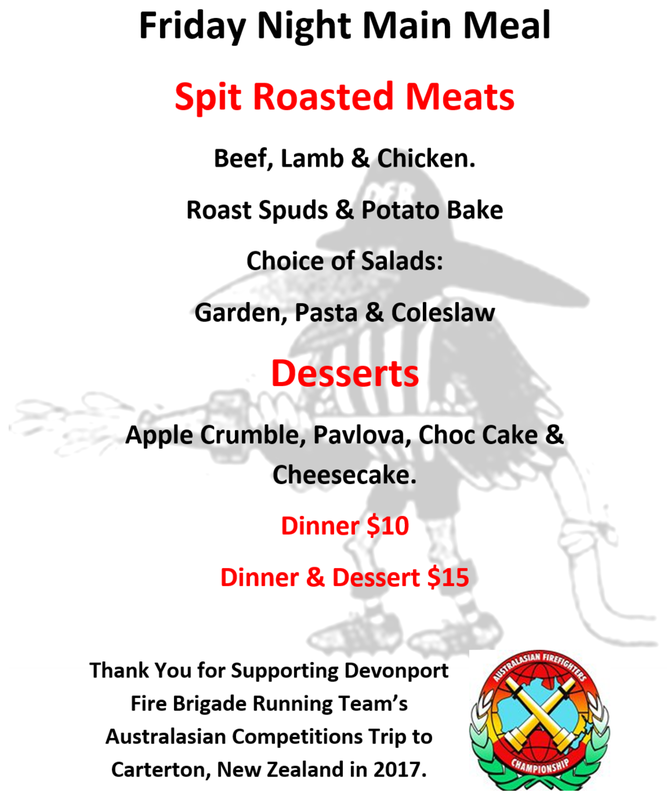 The Devonport Fire Brigade is going to provide a spit-roast main meal on Friday night (flyer below). To help with catering, please provide an estimate of how many meals your party would like - there is a space on the entry form for this.